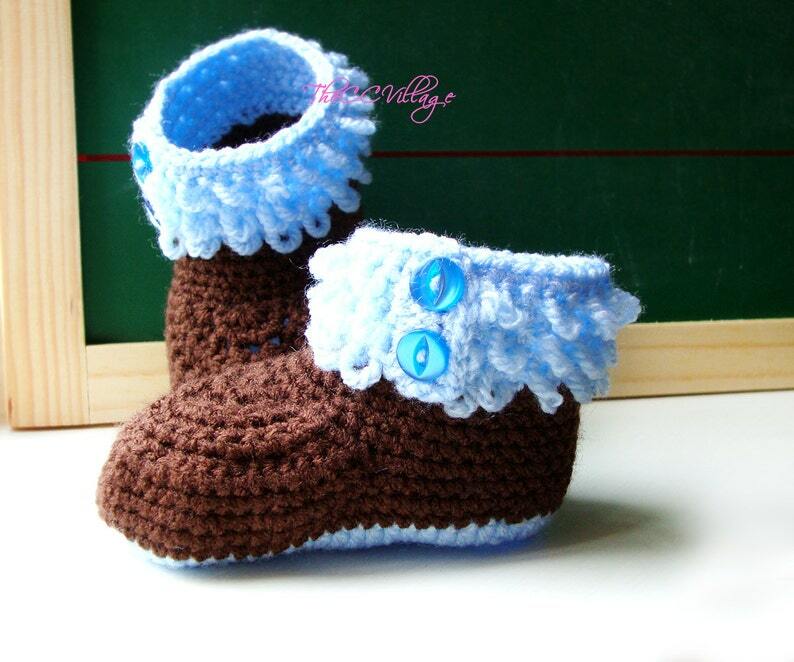 Brown and blue crochet booties for your baby boy or a gift to a special little one. These Baby Booties are the cutest thing ever. Hand crocheted by soft yarn. Please check the right size for your baby. Feel free to contact me if you prefer other color. I’ll be happy to help. Hand wash, reshape with fingers and lay flat to dry. These adorable Booties were made in non-smoking and pet-free home. The set is gorgeous! service was terrific! I heartily recommend this shop. You won't be sorry with your purchase. These are so adorable and so well made I couldn't stop looking at them when they arrived. Can't wait to mail them to my son and daughter in law who will also love them. Their first baby due this June. I love the hat. It's soft and fits great. I had to take a star away though because the hat was never shipped until I inquired with the seller about its whereabouts nearly two weeks after the purchase. I hadn't heard a peep from them. I'm wondering if I never contacted them if I would have gotten the hat at all. Conclusion: quality product; questionable service. You do not need a PayPal account to pay. You can pay with your cedit or debit card without having to sign up. Item will not ship until payment has been made. Please contact me before if there is a sizing or color issue. I'm happy to make an exchange or a refund. I want you to be happy with your item. Returns are accepted within 3 days of receiving the item. Refunds are processed after the item is delivered back to me. If you wish to cancel a transaction, please let me know before I ship the item. Once the item is shipped, there will be no refunds. International orders are sent by Airmail, take 10 working days, following day of posting. Orders in UK are sent by first class, takes 2 or 3 working days, following day of posting. Orders will be shipped after payment. Costumer will be notified after the item has been shipped. If you have any questions about my policies, please send me a message. We welcome customer orders. Please Contact me with your ideas.